CeRDI and the Corangamite Catchment Management Authority (CMA) have been awarded an Asia Pacific Spatial Excellence Award. 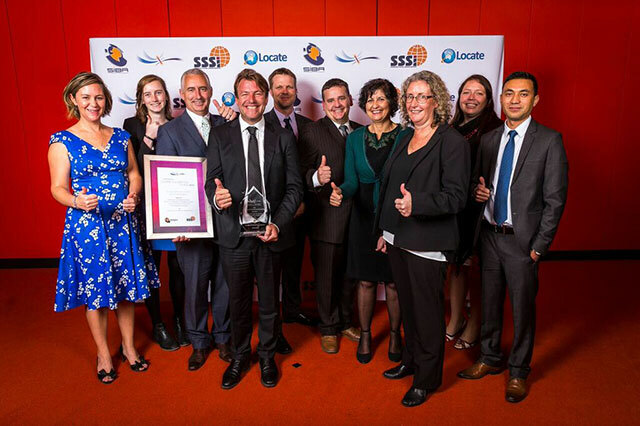 The awards were announced during a gala presentation dinner held during the Locate16 conference at the Melbourne Convention and Exhibition Centre, 12-14 April. The Corangamite Soil Health Knowledge Base qualified for the APSEA awards after receiving a Victorian Spatial Excellence Award in 2015. The project then advanced to compete with Environment and Sustainability Award winners from across Australia, New Zealand, Northern Territory and the Pacific Islands. The Corangamite Soil Health Knowledge Base project offers essential background knowledge required to implement the South West Agricultural Soils Plan across 15 Landscape Zones in the Corangamite region. The Corangamite Soil Health Knowledge Base has established a comprehensive knowledge base of soil health information that is assisting the broader community implement local catchment plans across the Corangamite region. Project partners include the Corangamite Catchment Management Authority and Corangamite CMA Land Health Program Steering Committee. In commenting on the award, CeRDI Director Helen Thompson reflected on the importance of collaboration through strong partnerships: “Community and partner engagement, prioritising a high level of co-creation and continuous innovation have been central to success with Corangamite Soil Health Knowledge Base project”. Bret Ryan, Land Health Manager for Corangamite Catchment Management Authority, said the Soil Health Knowledge Base contains more than 3,500 resources, such as reports, fact sheets, journal articles, spatial layers and maps: “It provides soil health information to farmers to encourage management practice change to create an enhanced sustainable agriculture sector in south-west Victoria,” Mr Ryan said. CeRDI were also finalist for the Award for People and Community for the Historic Urban Landscape (HUL) and Visualising Ballarat project. Historic Urban Landscape (HUL) and Visualising Ballarat has been established in collaboration with the City of Ballarat to provide insight into Ballarat’s past, present and sustainable futures. The portals have been designed to assist stakeholders, community members, practitioners and researchers to collaborate and identify community values, landscape values, with information about acceptable levels of change and to provide certainty as to priority development to attract and support. This participatory UNESCO-supported project is enabling a deeper understanding of values in the historic urban landscape to guide decisions to help Ballarat grow without compromising its heritage or losing its character. In addition to its awards success, CeRDI were active contributors at the Locate16 Conference as a bronze sponsor and with a booth at the conference exhibition. CeRDI researchers Dr Angela Murphy and Robert Milne also presented at the conference. Rob’s topic was Engaging Communities for Prioritising Natural Resource Management and Biodiversity Conservation Actions. Angela’s topic was the Historic Urban Landscapes and Visualising Ballarat: Citizen Participation for Sustainable Urban Planning and Design. For further information about these nominations contact Assoc Prof Helen Thompson.